Whether you are travelling in a car, motor home or towing a caravan it is imperative that your pet has its own sleeping area. Not only will the animal feel safe but your own bed will be free of animals and pet hair. Is there space in your vehicle for a cage? If so purchase one that can be collapsed down and put in storage so it doesn’t block the aisle of the caravan or motor home. 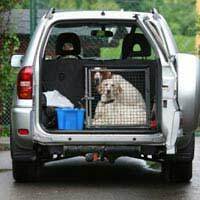 If the pet is to use it for travelling make sure it is secured to the car or motor home and cannot move if the vehicle is in an accident. If travelling with a caravan that has a table and seating area, place the pet bed under the table and secure the area with a piece of wood between the two seats either side of the table. This is ideal for smaller pets who will feel safe in the confined area. There are a multitude of pet beds on the market that can be used when travelling. Ideally they should be washable and portable so that they can be placed where needed and left out to be aired at every opportunity. Many pet owners favour the washable fleece fabric as any moisture goes through the fleece to the backing of the blanket and the pet stays dry. These fleeces or vet beds as they are also known make ideal rugs for the floor of the caravan and motor home and can be purchased from pet stores and many online auction and market places. Smaller dogs and other pets can now travel in large holdalls designed for pets. They are beds with handles and are much favoured by celebrities. More sensibly is the soft fabric collapsible kennel that many people use at dog shows. They pop into shapes in seconds and give privacy and comfort to many types of pets. These can be found advertised in pet publications and online. Unfortunately animals do smell however hard you try to keep them clean. Add a caravan, motor home or car to the equation plus a dog that has been swimming or become muddy through walking in the rain and your vehicle will not be fit for human occupation. Air conditioning does help a little but rules need to be set with the animal and owner. Have a stock of old towels ready that can be used to dry off the pet as much as possible before it enters the vehicle. Cover seats and beds with washable sheets and covers so that they can be pulled off and washed when required. Upholstery sprays are readily purchased to put the freshness back into furnishings and a doggy deodorant spray will keep the pet smelling fresh as well. If the vehicle has an awning this is the ideal place for your family friend to spend the night. Many motor homes have a garage area. On some models it is possible to have the area adapted to make a sleeping space or kennel for a pet. With washable bedding and the door replaced with a metal mesh for air circulation your pet will feel safe and secure. For safety there should be an entrance to the garage area from inside the motor home. If the pet can wander in a motor home place a barrier between the back of the motor home and the driver’s seat so that they cannot climb onto the driver’s lap and cause an accident. Stretchy fabric mesh panels can be purchased from car accessory shops that stretch between the back of the front seats of vehicles to stop children and pets from venturing forward. With a little forward planning pets can travel and sleep in comfort whilst journeying with their owners.